Chamomile Tea Benefits Homemade Skin Care and More! Chamomile tea benefits have been recognized for centuries. Chamomile looks similar to a daisy with its white petals and yellow disc florets. The flowers have a strong aroma and bloom in the early to mid summer months. It's found in populated ares of Europe, Asia, North America and Australia near roads, landfills or in cultivated fields as a weed. It has other names including: Wild Chamomile, Hungarian Chamomile and Pineapple Weed. The word chamomile is derived from Greek origin, meaning "earth-apple on the ground". It is so called due to the sweet, apple-like, scent of the plant. Chamomile tea has a golden color and delicious, fruity, flavor. There are two plants which fall under the chamomile name: Matricaria recutita, (German chamomile) and Chamaemelum nobile, (Roman chamomile). German chamomile is an annual plant while Roman chamomile is a perennial. Both come from different species of chamomile plants but they're very similar in appearance and are used interchangeably to treat similar conditions. The health benefits of tea can be numerous! Chamomile is anti-viral, anti-fungal, anti-microbial, antispasmodic, anti-inflammatory and contains antioxidants benefits. It alleviates: sore stomach, irritable bowel syndrome, colds, heartburn, menstrual cramps, muscle spasms, back pain, rheumatoid arthritis, migraines, asthma, sinus infections, toothaches, insomnia and more! Chamomile tea is rich in quertin, ( a phytochemical giving color to fruits and vegetables). It fights damage caused by free radicals. Glycine, an amino acid of chamomile, helps to maintain a healthy nervous system. With a hint of lemmongrass, chamomile tea can soothe the nerves, relieving tension and stress. Drink chamomile herbal tea before going to bed and combat insomnia. It's a caffeine-free drink with a relaxing, fruity, flavor. Chamomile helps speed the healing time of minor wounds, reduces skin damage caused by free radicals, (wrinkles, fine lines), lightens skin tone, soothes burns, soothes skin irritations, (hives, bee stings, acne, scrapes), reduces dark circle under eyes, reduces under eye swelling and puffiness and is useful for sensitive skin. It has, extremely, effective skin healing, purifying and antioxidant properties proven to aid in acne and acne scar reduction. It helps to get rid of blackheads and provide acne relief. 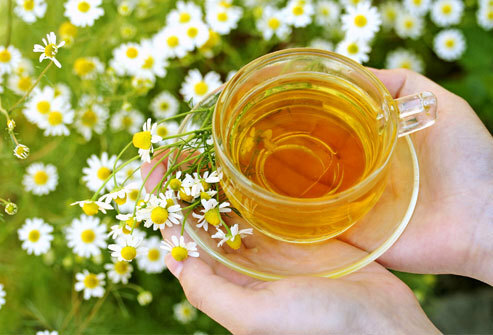 Chamomile alleviates skin diseases, including the mouth and gums. It's used in mouthwashes or for gargling. Chamomile tea blended with powdered milk is an exfoliating paste for sensitive skin. Place cooled chamomile tea bags, under eyes, to reduce puffiness. Roman chamomile and Blue chamomile essential oils both have skin healing properties. Blue chamomile essential oil has a high content of azulene which bears a blue color. This chamomile is derived from the German chamomile plant. Some Blue chamomile were bred for medicinal products only. Chamomile is used in commercial and homemade cosmetics, soaps, skin creams, lotions, face masks and more! Use chamomile in homemade skin care products and homemade soap recipes. Roman chamomile extract can be blended with other natural ingredients, such as aloe vera, rosemary and cucumber, for a natural homemade face cream. It can provide soft and soothed skin replenished with natural, moisturizing, healthful, nutrients. Chamomile can be used for making homemade soap. Blended with soap making oils, chamomile can help provide a homemade acne remedy and soothe dry itchy skin. Chamomile is commonly used as an ingredient for blond hair treatments. It lightens and brightens hair, gradually, when used as a rinse. It adds golden highlights to brown hair with continual use. Chamomile can be found in commercial or homemade shampoo. It strengthens hair and helps to repair split ends. It helps to maintain balance between dry and oily scalp conditions. Roman and Moroccan chamomile essential oils are used for aromatherapy benefits. Moroccan chamomile is not from a true chamomile plant. It's used mainly in perfume blends and for aromatherapy. Roman chamomile essential oil is used for its skin healing properties in skin care products and for aromatherapy. Calm nerves by inhaling dried or fresh chamomile, too. Chamomile is used in pet shampoos and conditioners. It promotes shine and manageability of fur and healthier skin. It relieves skin irritations and dry itchy skin, softens fur, helps to deodorize and condition the coat. It's blended with other gentle, soothing, conditioning ingredients like oatmeal or aloe vera, for maximum benefits. Approximately, one million cups of chamomile tea are consumed annually. It's a popular tea for medicinal, therapeutic, skin care, hair care, pet care and everyday pleasure. Chamomile tea and blends are available in grocery stores, supermarkets, health food stores, on-line and other locations. There are many chamomile tea benefits but there are, also, warnings to heed. CAUTION! Chamomile or chamomile tea can produce possible side effects. Discontinue use and seek the help of a licensed health care provider, (for you or your pet), if needed.